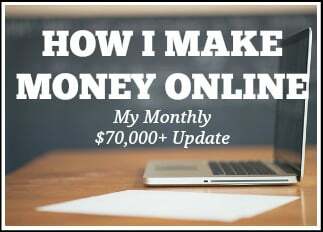 At the beginning of every month, I publish my monthly business income report. This all started out as my “extra income” report because before October of 2013, I still had my day job. In those extra income reports, I included all income that I made except for income from my day job. However, in September of 2013, I turned in my notice at my day job, and my last day was in October of 2013. Now, my income reports consist of the main way that I make an income each month, which is through my freelancing business. I publish my income reports each month for many reasons. 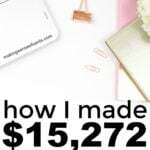 The main reason why I started side hustling is because I was reading other bloggers' (Smart Passive Income, Budgeting In The Fun Stuff, Newlyweds on a Budget) monthly income reports and they got me really interested and motivated. 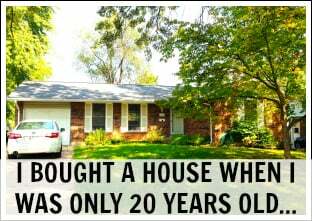 It was interesting and motivating to see how others were making money online. And these are REAL people. 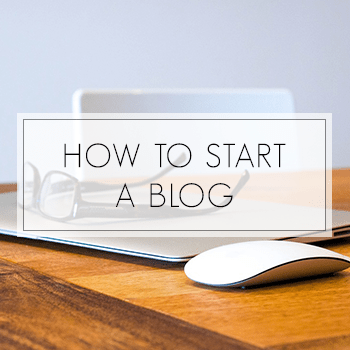 I didn't even know about any of this before I started blogging. 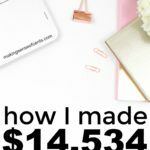 If it weren't for others posting their monthly online income reports, I don't know if I would have really gotten into side hustling. Also, I like to publish my income reports each month because it's a way for me to look back, learn from my mistakes and see what I need to change or improve the following month. Just sitting here and typing up this income report is a great way to keep in touch with my business goals. I know I say this every month, but it is the truth. Life is just so great now that I am doing what I want to do. I look forward to each and every day and it's a wonderful thing. I started my blog just as an outlet. 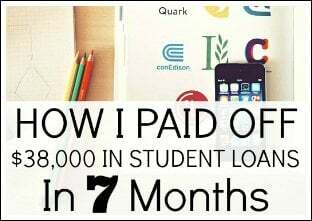 I never thought it would turn into a side income or into my full-time career. If you would have told me this a few years ago, I never would have believed you – I probably would have just laughed it off. June was a great month. Yes, I made only $40 more than the previous month, but I still call that a win. I also got married last month, and I can already tell that a ton of time has been freed up now that wedding planning is over with. I am working like crazy right now because I have so many ideas for my business and what I want to do over the next few months. Working is great when you are motivated to succeed. Also, I can already tell that July will shape up to be a good month if this first week is any indicator! 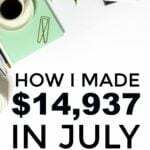 In June of 2014, I made $13,787 in business income, before expenses. It was another good month! This is for the month of June and before fees and expenses (fees and expenses that lower the amount above total around $1,000, which includes VAs for my other websites, technical assistance on my websites, PayPal fees, etc.) being taken out. One thing that I still have to remind others is that my freelancing business is still a job. I spend many hours every day, every week, and every month on my business. It does help that I have gotten much better at streamlining tasks and hiring others for certain jobs that I need done. It's all about finding what you are good at and outsourcing other tasks that you need done. This is not passive income, although one day I hope that much of my income is passive. 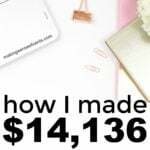 I have also been growing my freelancing business and services for quite some time, and for around one year I was not making a single dollar, but I was still putting full-time hours into my side jobs. Taxes also take approximately 30% of my extra income. I also have to provide for my own retirement, health insurance, vacation time, and more. This is something that not everyone thinks about. This is my full-time job, and for a few years I was working my full-time job while having my business as well. There were many sleepless nights! 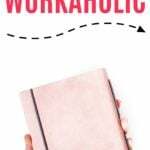 I was a workaholic, but thankfully it all paid off and worked out for me in the end. 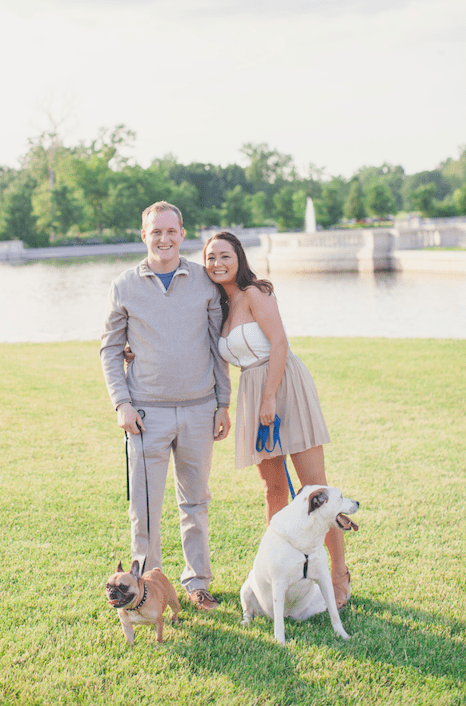 You can find my 2014 goals update here. Blog News – I had a site redesign. The big thing that has happened recently is that I had a site redesign! My designer was Chelsea at Olive & Ivy Design. She's been my blog friend for awhile now, and I love how simple, clean, and fun her designs always are. She is also very affordable, and you can check out her packages here which start at $200 for a design on Blogger. She does designs on WordPress as well. I recommend Chelsea if you need a site design. She is super friendly and she stuck by my side even though my mind was all over the place when it came to what kind of design that I was looking for. Luckily, she could read my mind and she hit everything dead on with what I wanted! My self-employment/financial independence blog Diversified Finances is still doing well. I'm hoping to do a site redesign on there soon as that current design is pretty basic (I made it haha). I have a travel blog that I started last year as well. I haven't shared the name yet, as I'm still building it up. Once I get an official site design on there, I will share that too. I do love my travel blog a lot. It's a great way to talk about my other love, which is traveling. In June, we also went on a 2 week long road trip to Colorado. For the most part, it wasn't much different working on the road than it was if I were just at home. Scheduling work and completing it ahead of time definitely helped me enjoy my trip. What tips do you have for working on the road? Start an eBook. – I started an outline of a possible eBook, but I still need to devote more time to this. Build my brand. – This is still slowly happening. Promote more. – I have been getting better at promoting, but I would really like to work on this more. I would love for something to go viral. Accept more interviews. – I had three interviews in June, and I have one scheduled for July already. June wasn't a bad month for staff writing, but it wasn't one of my best. Over the next few months, I plan on applying for at least a few staff writing positions so that I can get my name out there more. I have been adding more and more travel blogs to my staff writing portfolio, which has been great. It's nice to talk about something else besides personal finance all the time, even though I still do love personal finance. What should I do to find more staff writing or virtual assistant jobs? This is a question that I receive often. This question is now a permanent fixture of my monthly business income posts because it is such a popular question each month. There are two main ways for you to find staff writing and/or virtual assistant jobs – either they find you or you find them. Them finding you can be more difficult, as there is nothing really too active that you can do to speed up the process. 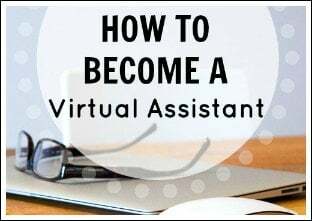 So, if you want another job sooner rather than later, then you should go out there and try to find a new staff writing or virtual assistant position yourself. If you are wanting new clients to find you, then there are things you can do though. Usually website owners find me through my Contact/Hire Me tab above, and this is something that I think all bloggers should have on their website. Start one now! That is my number one tip! No one can hire you if they don't even know that you are looking for a freelancing job. You also might want to post in related forums. There are online job forums out there, you just have to search for them. You need to let your services be known and possibly even ask others to spread the word. If you are wanting to find clients yourself, then there are a few different ways you can do this as well. You can search job boards, reach out to publishers that you want to work for, and more. Check out my article How To Find A Writing Job for more information on this. Here's my monthly shameless plugin: If any of you need a staff writer or just a one-time content writer, let me know. Whether you need a couple of articles every week, or just a single post with no ongoing relationship, I am your writer. 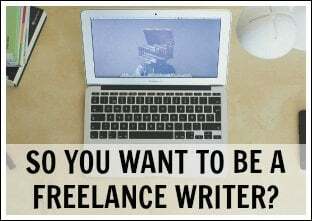 I can write regular content and be hired as a staff writer, content to fill in gaps in your writing schedule, content for advertising and so on. My turnaround is fairly quick and I am reliable. 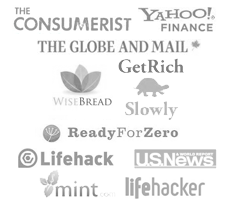 In March, I started my series on buying websites for profit on DiversifiedFinances. 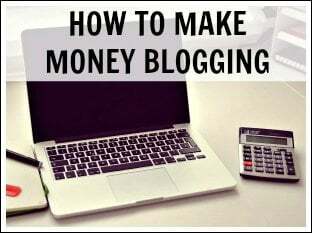 Read Buying Blogs/Websites For Profit Part 1. I am no expert in buying websites, but it is something that I would like to start doing more often. In the month of June, I managed a few different websites for other owners. They all went well, and blog/media management is a service I enjoy. Manage and approve comments. If you are busy, then you want your blog to continue on just like if you were still there. I get rid of any spam, and approve real comments. I also reply to comments on your articles if that is something that you normally do (such as answering any questions and so on). Watch to make sure that your website does not go down. I check multiple times throughout the day to make sure that your website is up. Monitor e-mails and reply when and if necessary. If you want a total break from your website, then e-mail management is something that most of my clients sign up for. Make sure postings go live when they should. Sometimes they won't, and this is where I come in. I will make sure that everything is scheduled correctly and actually happens. Affiliate income – Boy, has this been slow. 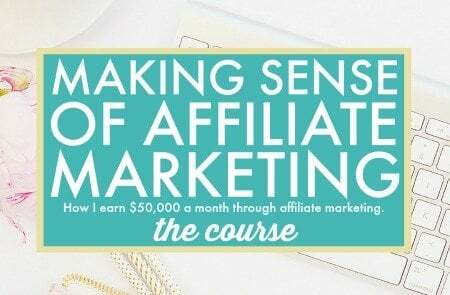 I started to get more into affiliate income in June, but not as much as I would have liked. I have many programs and services that I would like to review soon, but I have found that they are much harder than writing one of my usual posts. A lot more research goes into them because I want to make sure that I am going over all positives and negatives for my readers so that reviews on my website don't just sound like a boring advertisement and a waste of everyone's time. What type of reviews would you like to see? 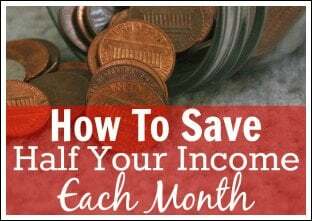 One thing that I am asked nearly every time I publish my monthly income report is whether or not I can further break down my income. This is something I have never done before last month, mainly to protect myself and those I provide services to. Mainly, I kept it private in the past because I wanted to have a little bit of privacy. Above, I sort of broke it all out for the second time ever, and in the next few months I plan on breaking it apart further and further. I know some of you are waiting for me to break it apart down to the very exact amount from the very exact source, but I do like to keep it a little private for now because I do need to protect the income that I am making since this is my livelihood. 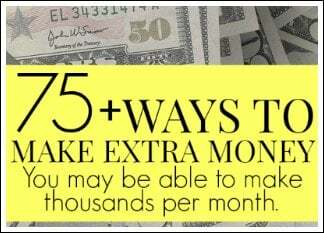 Website related income includes all of my websites that I own. So, if I provide social media management or blog management for someone, that amount gets put into the “Managing websites and social media for clients” income instead and not in the “Website related income” category. 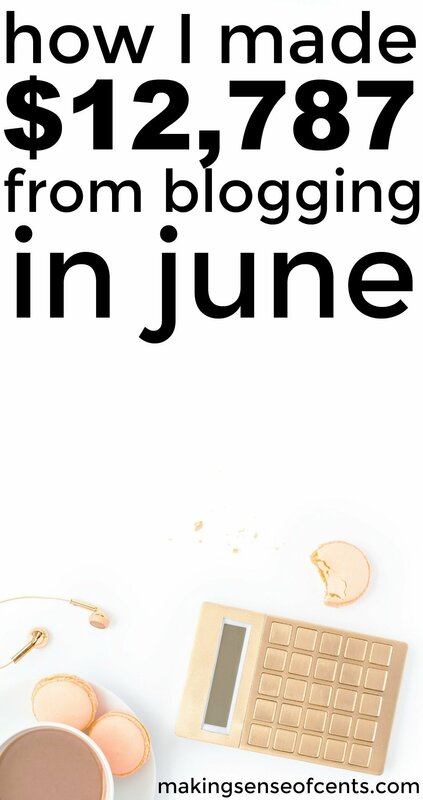 How did you do in June? 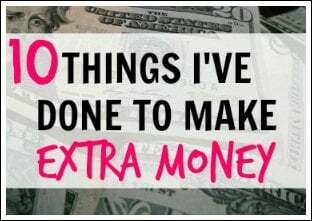 What are your extra/business income goals?